Nearly everyone at Grand Canyon University knows about the Havocs, those exuberant, purple-painted, incredibly loud Lopes fans whose cheers and antics can drive opponents to distraction. GCU’s raucous student section, the Havocs, is revealing its passion for the community with a new program this fall. Havocs with Heart will perform service projects for five nonprofits, which also will be honored for the work they do during select GCU basketball games this season. Against a backdrop of several thousand spectators at a home basketball game, the Havocs swarm into GCU Arena, hundreds strong, to the tune of an upbeat song during their own special introduction. “Lopes Up! Lopes Up! Lopes Up!” they shout at near ear-splitting decibels, jumping up and down in the front rows of student sections and generally acting crazy all game long. The Havocs went all out last weekend at Midnight Madness in GCU Arena, where the men’s and women’s basketball players and coaches were introduced. Starting this month, the Havocs are harnessing some of that energy and shining it on five local nonprofit groups that help some of those most in need: the homeless, the hungry, the chronically ill and the mistreated. The new program is called Havocs with Heart, a service activity arm of the Havoc student group. Their first activity will be to support walkers in the HopeKids HopeWalk, scheduled for 7:45 a.m. Saturday at Notre Dame Preparatory High School in Scottsdale. 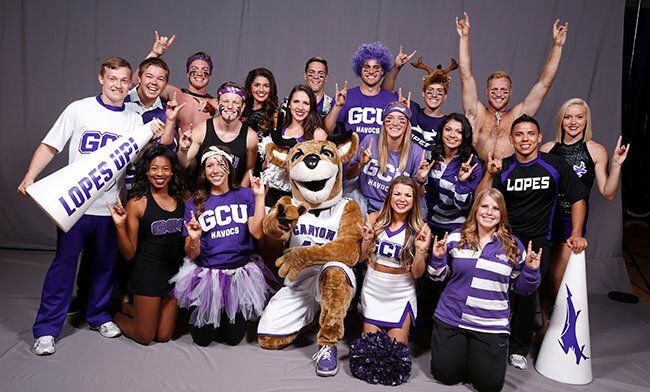 Instead of cheering GCU athletes, Havocs will cheer for people helping children with cancer and other illnesses. Christina Wagner, the Arena’s marketing manager and one of the main organizers of the new program, said the Havocs will be there to support more than 500 walkers, including the families and children fighting a battle against cancer and long-term illnesses. The same zany fans who make a difference during games now have a chance to make a difference in the community, Kaiser said. The Havocs student group is growing exponentially. Three years ago, the group had 168 students. Last Sunday, students could purchase Havocs memberships for $20, which includes admission to and premier seating at all home basketball games and a Havocs jersey, among other goodies. More than 1,000 students signed up, Wagner said. Every GCU student is technically a Havoc, if not the purple-hued, sports-nut variety, and each is encouraged to participate in every service project, Kaiser said. The four other nonprofit groups Havocs with Heart is supporting are the Phoenix Rescue Mission, Best Buddies, the Tumbleweed Center for Child Development and the Arizona Animal Welfare League (AAWL). The students will participate in a service project for each, including a “Bark Break” in December, when AAWL dogs will be on the Quad in front of the Arena to play with students who are going through finals, Wagner said. Each nonprofit will receive between 300 and 600 tickets for a selected game at which it will receive publicity, Wagner said. The organization’s mission and a video of its Havocs with Heart service project also will play on the Jumbotron, she said. “We have a captive audience 19 times throughout the season. We have this audience, and we have these nonprofits, and the idea was to use our basketball games as a platform,” said Wagner. 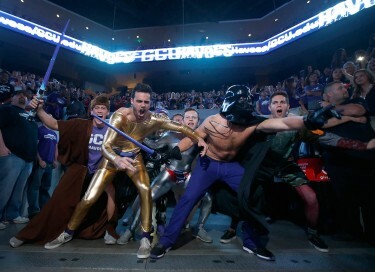 The Havocs are a big name on GCU’s spirited campus. She said other companies also are jumping on board to support Havocs with Heart. Coca-Cola is donating purple T-shirts, and Papa John’s Pizza and Raising Cane’s are donating food.